Pier 48 Stevedoring LLC, located at Ohio River mile marker 48 is able to serve all your material handling needs. 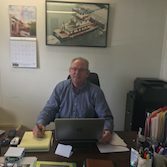 Our President Larry Heck and part owner, has 43 years experience on the Ohio River in the River terminal industry. Before starting Pier 48 he spent 40 years with North Star Coal Company/Parsons Coal Company in which held positions as mechanic, foreman, tankerman, boat pilot, superintendent, and eventually General Manager of Parsons Coal Company and Assistant Vice President of North Star Coal Company. Larry Heck is active in the Maritime Industry, as well as local community and business affairs. He is current member of the Waterways Association of Pittsburgh, current member and past chairman of the Three Rivers Pollution Response Counsel, USCG Area Maritime Security, Wellsville Chamber of Commerce, US Route 30 Action Committee, President of the East Liverpool Broadway Wharf Committee and member of the East Liverpool Rotary. Unique conveyor system able to load trucks directly off the conveyor from the barge. Direct Interchange to OH Route 7, access to OH SR 11, 39 and 45. Also PA SR 30 and 68.